PDP stated this in reaction to declaration by the National Chairman of the All Progressives Congress, APC, Adams Oshiomhole that his party won’t share the leadership role of the National Assembly with it. 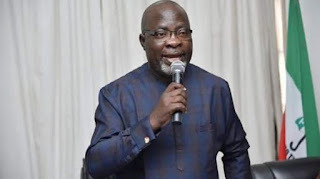 A statement by PDP’s spokesperson, Kola Ologbondiyan said: “It is, therefore, laughable and amounts to empty grandstanding and self-delusion for President Muhammadu Buhari and the factional National Chairman of the All Progressives Congress (APC), Adams Oshiomhole, to posture as if the presiding offices and Committee Chairmanship in the National Assembly are exclusive rights of the APC. The opposition party “reminded President Buhari and Oshiomhole that the APC had in the past benefited from the provisions of section 50, with the defection of then Speaker of the House of Representatives, Rt. Hon. Aminu Tambuwal from the PDP to the APC, in October 2014, without relinquishing the speakership of the House to the PDP; a development that was applauded by President Buhari, as then opposition leader as well as the APC, through its then National Publicity Secretary, Lai Mohammed. “In fact, the former Minority Leader of the House, Hon. Femi Gbajabiamila, echoed the Constitutional provision that “the constitution requires only that the Speaker or Deputy Speaker of the House of Representatives shall be elected by members of that House from among themselves.